Each year Seed Savers Exchange members from across North America trial garden varieties from SSE's genebank collection. They send us reports on performance and taste qualities, and photos of the varieties growing in their gardens and harvested in their kitchens. Our genebank stewards over 20,000 varieties, many of them unique family heirlooms not found in the seed trade. The M-GEN program gets these varieties into the hands of gardeners, who then create portraits to share with other gardeners. It is our hope that this project inspires gardeners to explore and preserve our gardening heritage, and share how this rich diversity can assist us in facing future challenges. By gathering information from growers across North America we can study the impact that climates/regions, distinct weather events, and even perhaps urban or rural environments have on growth habit, performance, and flavor of the varieties, giving us a more complete picture of each variety, and in the long term, documenting how North American gardeners respond and adapt to the challenges of climate change. Below you'll find a comprehensive report on the results of the 2013 growing year from Seed Savers Exchange's Member Grower Evaluation Network. We host a September Tomato Tasting at Heritage Farm, which has been attended by thousands of people, and since 2012 the SSE Evaluation team has contributed samples from varieties we’re growing out for the Collection. Each year we secretly (or openly) hope that one of these “unknown” Collection varieties will unseat the titans from the SSE Catalog and win top honors among the 70+ varieties sampled. So far, no luck. But ‘Igleheart Yellow Cherry’ has come closest, earning 3rd place in 2012 and again in 2013. Flush with the thrill of the podium in 2012, we selected 'Igleheart' for M-GEN in 2013. A few growers had crop failures. We sent the seed out too late for Gary Staley in Florida, and the Florida summer did them in. A couple of growers had blight epidemics that wiped out every tomato in their garden, including 'Igleheart'. Though a few tomato varieties have blight resistance, it appears 'Igleheart' is not among them. Most growers rated 'Igleheart' as midseason maturing for a cherry tomato. Most rated it average or high for yield. Some found it to be rampant and prolific, while others found it both less vining and less productive than other cherry tomato varieties in their garden. A couple of growers took initiative and grew some 'Igleheart' plants in pots on a patio, and reported favorably on the results! As expected, taste is where 'Igleheart' stood out. Mrs. Igleheart believes it is less acidic than other cherry tomatoes. M-GEN growers agreed. Maybe that’s why we can’t get it past 3rd place at Heritage Farm—it is hard to be selective when bulk-harvesting in a frenzy! No M-GEN growout ever caused me more fretful worry than ‘Landkammer’ popcorn. First, we requested a fairly large population size to be grow. That excluded our urban growers from the trials. Would enough people still want to do it? Yes, as it turned out. Next, we asked participants to not only grow popcorn, but dry it down correctly and pop it! While Don Kellums of Illinois used to grow 2.5 acres of popcorn every year (and he and a few other veterans could be counted on to know what to do), many of the volunteer popcorn growers had never grown popcorn or popped home-grown popcorn. Strong in my memory was a staff ‘movie night’ at Heritage Farm a few years back where a highly anticipated attempt to make homegrown popcorn failed completely (kernels too dry). Would M-GEN growers prove more competent than SSE staff? ‘Landkammer’ came to SSE from Sue Eckermann Golik in 1995. She obtained the variety from an elderly man in Washington, who obtained it from his parents. His parents grew the variety in their garden in Germany and took it with them to the United States. It is named for its family of origin. ‘Landkammer’ received strong reviews in the field, as it worked to produce its ears. Growers reported height ranging from 5 to 6.5 feet, with 6 feet a typical observation. A few said it had no tillers (secondary shoots), while others observed 1-2 on average. One to two ears per plant was the most common report, though some reported up to 5 ears per plant was possible. Many growers commented on strong health and vigor and excellent uniformity of this variety. Lodging (stalks falling over) is a common problem with open-pollinated, heritage corn varieties, but many ‘Landkammer’ growers reported no lodging at all, and it was minor for those who experienced it. The ears are small, but well-filled, with small kernels, even for a popcorn. Growing ‘Landkammer’ proved a satisfying experience for nearly all growers, but with its small ears it is unlikely to break yield records. Many growers described it as a “lady finger” type of kernel that produces a small popcorn. All growers noted this trait, but none commented critically against it. We asked growers to describe their popcorn harvest and drying methods in detail, and several obliged. Hopefully at some point we will use some of these descriptions in a guide to home-popping popcorn—they collectively describe several good ways to get the job done. Some of the first-time growers experienced trial and error as they learned to gauge their harvest. ‘Landkammer’ earned strong reviews for its popping ability and taste, which is as much a credit to its M-GEN growers as the popcorn itself. Some growers compared ‘Landkammer’ to store-bought popcorn, a contest ‘Landkammer’ always won. In 2015, SSE staff plan to grow and pop several popcorn varieties at Heritage Farm in an effort to prove that we, too, can achieve competence in homegrown popcorn. Wish us luck. ‘Byrd’ stood out to us in Heritage Farm evaluations as robust and tasty, hence its selection for M-GEN.
‘Byrd’ came to SSE from Jim Tjepkema (MN TJ J), who still grows the variety. Jim obtained it in 1990 via the SSE Yearbook from Dorothy Jones (AL JO D). Dorothy first listed it in the Yearbook in 1985. Dorothy’s Yearbook description indicates that the mustard originally came from Georgia in 1839 with the 3rd great-grandmother of Dorothy's husband. It is also a good example of how the Seed Savers Exchange Yearbook works to preserve seed varieties —Dorothy shared a variety known only to her family, and it got picked up and stewarded by Jim, strengthening the likelihood that this unique variety will survive into the future. M-GEN growers had an unusual number of crop failures for ‘Byrd,’ mostly occurring early in the season for a litany of oddball reasons. Many of these failures were under conditions that would have killed any mustard. However, one trend that emerged is a few growers felt that ‘Byrd’ seedlings could not survive damp and cool weather. It may appreciate a later (or warmer) start, maybe more so than the average mustard variety. Those who got 'Byrd' to grow for them found it to be healthy, productive, slow to bolt, and tasty, with a good mustard kick to its flavor. M-GEN growers evaluated 3 bean varieties from the collection identified as having ‘multi-purpose’ potential for culinary use, with ‘Cherokee Trail of Tears’ from the SSE catalog included as a ‘well-known’ benchmark variety. They evaluated each variety for use as a snap bean, shelling bean, and dry bean, and then rated their overall favorite of the group. Donated to SSE in 2005 by John Simmons of Pontotoc, MS. In his donation letter, John wrote that his great-great-grandmother, Rhonda Herring George (born 1828) was the first person known to have planted this variety in John's family. Many years ago, one of John’s relatives, who also grew the beans, died in a house fire. The family thought that the ‘Grandma George’ the beans had been lost in the fire, too. But John’s mother, Sarah, had some seed. That prompted John to spread the beans out among more family members, and today there are many in the family who grow it. Given to SSE in 1977 by the late Dr. John Wyche, SSE member from Hugo, Oklahoma. Dr. Wyche’s Cherokee ancestors carried this bean over the Trail of Tears, the infamous winter death march from the Smoky Mountains to Oklahoma (1838-1839), leaving a trail of 4,000 graves. Donated to SSE by Fred Brinker in 2006. Passed down in the Brinker and neighboring Carrier families for several generations in upper Mason Co., WV. Originally grown there by Fred’s great-grandparents, Jerome and Hepzibah Brinker, in the 1800's. Donated to SSE by Luke Kapayou of Tama, Iowa in 2010. Luke obtained it from his grandmother, Agnes Kapayou, and it’s been grown by several generations of Luke's family within the Meskwaki Tribe of Tama Co., Iowa. The first written documentation of its use in the tribe was in 1902 by ethno-botanist William Jones. Meskwaki tradition holds that their stewardship of the variety, named for its color and growth habit, goes back much earlier than 1900. Ratings for overall productivity were all over the map, with not enough sample points for any geographic or climate trends to emerge. As one example, Don Kellums in Illinois found ‘Grandma George’ to be his least productive variety, while Jane Jensen in Utah got more beans from ‘Grandma George’ than all her other varieties combined. Some growers felt that ‘Red Climber’ was much later maturing than the others in the group, while others did not observe any difference. Growers who had to wait for ‘Red Climber’ didn’t appreciate delayed gratification and tended to rate it lower overall. Some of these same growers commented that it was the healthiest and longest lasting of the four varieties by season’s end, but the first impression seemed to carry the most weight. The consensus was that ‘Red Climber’ was the least suited for snap beans of the group, though some thought it was okay. 'Grandma George', 'Cherokee', and 'Brinker/Carrier' all rated highly as snap beans. Each had advocates for it as the best of the group, while other growers lumped them together and felt they were largely indistinguishable. 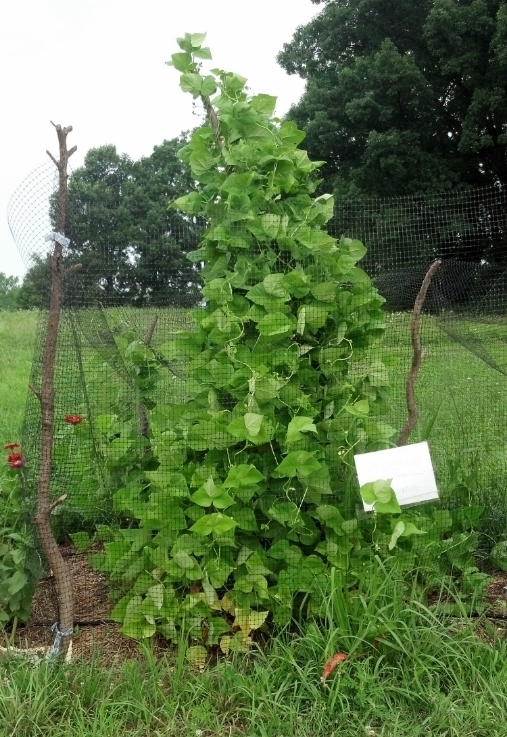 As a shelling bean and as dry beans, 'Brinker/Carrier' and 'Red Climber' both consistently ranked high, while 'Cherokee' and 'Grandma George' were viewed as average. Some growers felt that ‘Cherokee’ and ‘Grandma George’, both black-seeded varieties, were not much different from one another. Comments for its qualities as a dry bean were similar. Every bean variety in the trial was ranked #1 by at least one grower. Overall, 'Brinker/Carrier' was tops with an average place of 1.8, and the other 3 ranked behind at 2.4-2.6. 'Cherokee' and 'Grandma George' both ranked similarly as good snap beans and serviceable for other uses. Some growers had strong preferences for one or the other, but in the end they averaged out with similar ratings for all categories. 'Red Climber' won advocates for its taste quality and vigor, but got dinged for late maturity and often ranked behind 'Brinker/Carrier' in taste. 'Brinker/Carrier' was a triple-threat for all culinary uses, often a taste favorite as dry bean and shelling bean and productive for most growers. It rarely ranked lower than second, and only one grower ranked it last (fourth). The pepper trial linked 3 Collection varieties noted for at least some pepper flesh combined with moderate heat, with ‘Georgia Flame’ added from the SSE catalog as the more widely known ‘benchmark’ variety. SSE obtained ‘Ram’s Horn’ from Jim Fischer of Elkhart, IN, whose family has grown this variety in the Asheville, NC area since circa 1885. Donated to SSE by Albert Lemme of Altoona, PA. Maintained by Albert since 1986. Originally from Italian immigrant families in the area who began growing the variety circa 1895. It’s the less well known ‘sibling’ variety to Lemme’s Sweet Pepper. A piquant pepper from the Republic of Georgia, up to eight inches long, with thick crunchy flesh…an excellent salsa pepper. Heat scores ranged from moderate to low for all four varieties, as expected. The heat-ranking relationship among the varieties ranged widely from grower to grower. As one example, Elizabeth Hooton of Illinois felt 'Lemme's' was the hottest of the group, while Daniel Brisebois of Quebec felt it had no heat whatsoever. 'Georgia Flame' consistently rated as the latest maturing and was ranked by most as lower productivity than the others. It made up ground with some growers who felt it had excellent taste. Some growers rated it last for productivity but first for overall ranking. 'Lemme's' was often commented on as a high producer, but was also the most often cited for disease issues, blossom end rot, and other quality problems. Some growers felt the useable yield, as a result, was about the same as less productive varieties. 'Derksen' produces the most compact plant and the smallest fruit of the group. 'Lemme's' produces the largest fruit, followed closely by 'Georgia Flame'. Overall ratings were 'Lemme' 2.2, 'Derksen' 2.3, 'Georgia Flame' 2.5, 'Ram's Horn' 3.0. 'Ram's Horn' was the wallflower, the variety most likely to stand in the background and not get much commentary for positive or negative in the group. It was a few growers' least favorite and the only one never ranked first. 'Lemme' and 'Georgia Flame' each had some strong advocates for taste qualities, though some docked 'Georgia Flame' for being a late and low producer, and 'Lemme' for having disease issues. And each had growers unimpressed by their eating qualities. The bulk of the number one rankings went to these two, but they each attracted their share of 3rd and 4th place finishes as well. 'Derksen' was the plugger of the group, generally free of any trouble during its growout and well liked (if not always a favorite) for its taste qualities. ‘Grandma Hadley’s’ was donated to SSE in 1988 by Pam Andrew. Pam obtained it from her great aunt in southern Illinois, who remembers her Grandma Hadley growing the variety when she was a child, circa 1915. Acquired by Kelly Yeaton (PA YE K) in about 1994 from Mr. Nestor Keene, a barber in Boalsburg, PA who offered these seeds to patrons of his shop. Maintained by Nestor and his wife Amber Keene since 1937 when Nestor's aunt Mae Smith of Millheim, PA gave them the lettuce. Mae is said to have originally received the seeds from a family named Zimmerman who had grown the lettuce for several decades in Brush Valley, PA. Donated in 2005 by Maynard Kropf. Maynard writes that he is sending lettuce seed passed down from his grandparents, Samuel and Ella May (King) Kropf. Samuel and Ella were both born and raised in Amish Mennonite homes. Maynard stated that in about 1930, on one of his grandparents’ trips to the small town of Stewardson, a man gave Ella some lettuce seed. The Kropf's planted the seed and found the lettuce to be some of the best they had ever eaten. They saved seed from it each year and as the family grew, it became a family favorite. Introduced to the seed trade by Renee Shepherd. First offered in the 2005 SSE Yearbook by Margaret Lauterbach of Boise, Idaho. ‘Hadley’ was ranked first more than half the time and won going away. ‘Aunt Mae’ was a solid but distant runner up, with ‘Mantilia’ and ‘Ella’ in third and fourth. ‘Ella’ was the variety that seemed most delicate—succumbing to disease or ‘melting’ away early in some cases, though it was well-liked for taste. But just to show that one variety is not the solution for all situations, ‘Hadley's’ West Virginia growout by Lynda of Shade Tree Nursery was afflicted with a mosaic virus that did not affect the other 3, resulting in it being placed last in her trial. Most M-GEN growers rated ‘Hadley’ the most productive, healthiest, and slowest to bolt variety in the trial. It was not always the favorite for taste, and seems to have a capacity for bitterness under some conditions. But it was usually well liked for its flavor and outperformed the others so thoroughly that it was consistently rated at the top. In 2013, 78 M-GEN growers from 32 states and Canada collectively grew 15 varieties from Seed Savers Exchange. The goal of the M-GEN program is to collect feedback on varietal performance, regional adaptation, and culinary qualities when open-pollinated varieties are grown by SSE members across North America. For the first time, we had two types of evaluations, single variety and 4 variety trials. The 4 variety trials were a new addition to M-GEN, very successful, and repeated again for 2014. In the trials, participants grew 4 varieties of the same crop type side by side and compared them all. We threw all kinds of challenges at the M-GEN growers in 2013, not only varietal trials, but more extensive taste evaluations, and even home-grown and home-popped popcorn. Our dedicated network of growers handled it all with aplomb; we thank them for their hard work and selfless volunteer efforts to help us learn more about these varieties and regional garden performance. Do you want to help us evaluate the collection? Please include "M-GEN Trials for 2015" in your subject line. I am NOT a current Member. We'll be getting back to you soon about prospects for the 2015 M-GEN growouts. For 2015, Phillip Kauth will be taking the reins of the M-GEN program. If you’d like to join M-GEN for 2015, please contact mgen@seedsavers.org or call Phil at 563-382-5108. We hope you will join us!